Mid-December evenings can mean extremely cold temperatures. It is definitely not the time to be out in the elements, especially with a one-year old child. Unfortunately, this was the case for a young family; their dreams were going up in flames, while the temperature was falling to 30 below zero. The home was their first, and they were remodeling it, putting everything – both money and sweat equity — they had into it. Like many Midwest families, they use a wood-burning stove to keep their home warm. The father was at work, while the mother was home with their son. The fire began on the lower level of the two-story home and smoke quickly consumed the upper level. Luckily, the mother heard the smoke alarm, ran to her infant son, called for the dog and escaped safely – barefoot, and with just the cloths on their backs. The fire grew so large that four separate fire companies responded. Even with their most valiant efforts, the firefighters were unable to save the home. The family lost everything – all their remodeling efforts, all the Christmas presents, already bought and wrapped. The ruin was later bulldozed. 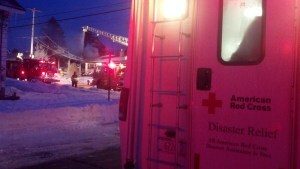 The American Red Cross Disaster Action Team, including Sharon Rohrer, arrived shortly after the firefighters. They had two missions: support the young family through this devastating situation, and provide hot coffee, water and nourishment to the firefighters and first responders. Neighbors opened their doors to keep everyone warm, and the Red Cross was welcomed throughout the neighborhood. 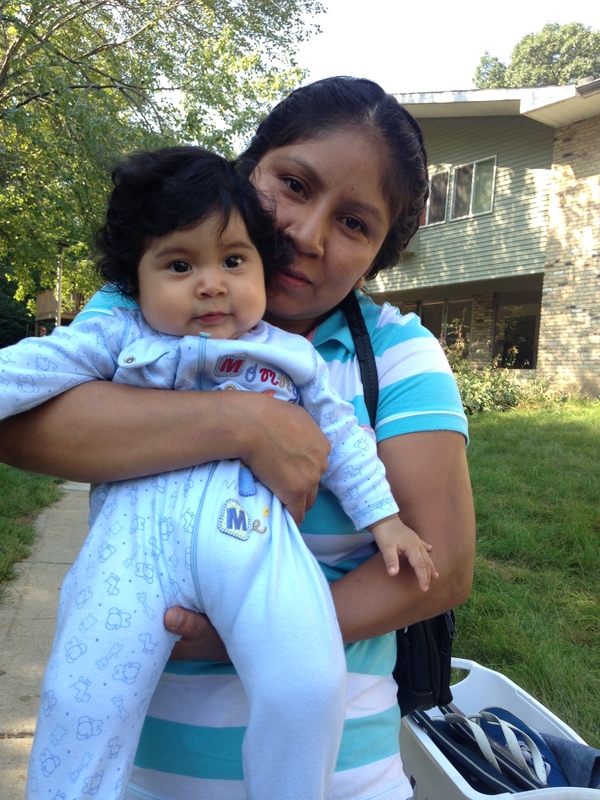 For the family specifically, the Red Cross ensured they took the first step to recovery. This included giving them someone to talk to, help in figuring out what comes next, the community resources that were available to them, and immediate funds to jumpstart their recovery. A client assistance card was provided so they could purchase winter clothing, shoes, and even food. The support of the American Red Cross is only possible due to the dedicated staff and volunteers, community partners and donors alike. For more information on how you can help, please visit redcross.org. Three day weekends for many include family, fellowship, food and fun. For the Garcia family, Labor Day turned into a day of panic, horror and help from the American Red Cross. In the early morning hours, Felipe Garcia was woken by the faint sound of the hallway smoke alarms, and he smelled smoke. He rose from his bed, went to hallway door, opened it and immediately shut-it. “It was filled with black-smoke so thick I didn’t want to take my family out there,” he stated. He turned, yelled for his two teenage boys to wake-up, and for his wife to get herself and 5-month old Arianna up. Even though they lived on the second floor of the Middleton, Wisconsin apartment building, he knew they would have to escape out the window. “We did what we had to do. So I lowered the first boy out the window as far as I could reach and then let him go. He hit the ground hard. We repeated this for the second teenager. When I turned to my wife for the baby, we knew it was imminent I would have to drop her too. With the boys on the ground, they caught her softly,” he recalls. Standing outside their burning building, they watched as the fire department fought to save the building, and assessed their injuries. One of the boys’ ankle, and the others’ wrist, was throbbing and the baby wouldn’t stop coughing, so all went to the Emergency Room for immediate help. X-rays for the boys proved nothing was broken. The fire investigation was going to take all day, and depending on power and water, residents were likely not be able to return for up to a week, or longer, due to the damage. With the weekend temperatures reaching 92 degrees, and humidity nearing the same level, it was miserable for anyone to be outside for long periods of time. Therefore, the Red Cross opened a shelter in the nearby Middleton High School. This air conditioned building had bathrooms, cool air and places to gather. Not only that, but the residents were greeted with coffee, juice, water and hot breakfasts, plus some donuts too! From the time they arrived, the sense of relief was evident on their faces. As people started to relax, the Red Cross’ mental health and health services responders went table-to-table to casually strike up conversations, check on everyone’s emotional state, and to ensure no injuries were overlooked. To a casual observer, the shelter almost looked like a regular family reunion: people were chatting, kids were playing and food and beverages were provided throughout the day. Best of all, little Arianna was smiling, giggling and acting like a 5-month old. As this was happening, the Red Cross team back at the fire site was working with the apartment management and fire and local officials to determine what emergency housing needs would be needed. As for the Garcia family, they were able to fill clothesbaskets with clothing, medications, a few toys and items they would need. Family and friends stepped in to offer shelter while their apartment underwent cleaning and repairs. In addition, the Red Cross provided financial assistance for food and miscellaneous needs. The Red Cross also provided personal hygiene items and helped them navigate the recovery process. When you wake up the next day following a fire, you experience a flood of emotions. What do we do next? Where will we live? Who is going to help us? It’s really powerful knowing that the Red Cross will be there for you to help you take those next steps. The family in Two Rivers who lost everything to a home fire last night will meet with our trained Casework department to determine what emergency needs they have, what the Red Cross can provide to them, how to work with their insurance company and what other community resources are available to them. Midwestern communities are always moved to do something for families when disasters strike – it’s what we do and it’s in our blood – however, it’s not always the best route to take. Right now, the family has their emergency needs met – thanks to our wonderful donors & community partners – so instead of overwhelming them with stuff, consider making a donation to Red Cross Disaster Relief so families in the future can receive the same services. The best way to help a disaster victim is through a financial donation to the Red Cross. Financial contributions allow the Red Cross to purchase exactly what is needed for the disaster relief operation – no matter if it is big or small and personal. Thank You! Four adults were displaced this morning after a basement fire at 1221 Cass St. on Green Bay’s east side. Firefighters responded at 8:52 a.m. to smoke coming from the one-story home, said Green Bay fire Battalion Chief Paul Arvey. The fire was contained in the basement within 15 minutes and the home was mostly damaged by smoke, he said. No one was injured. A man on the scene said he was in the basement when the fire began and he believes it started in a furnace. The property is owned by Gloria Stache and valued at $70,500, according to Brown County online land records. 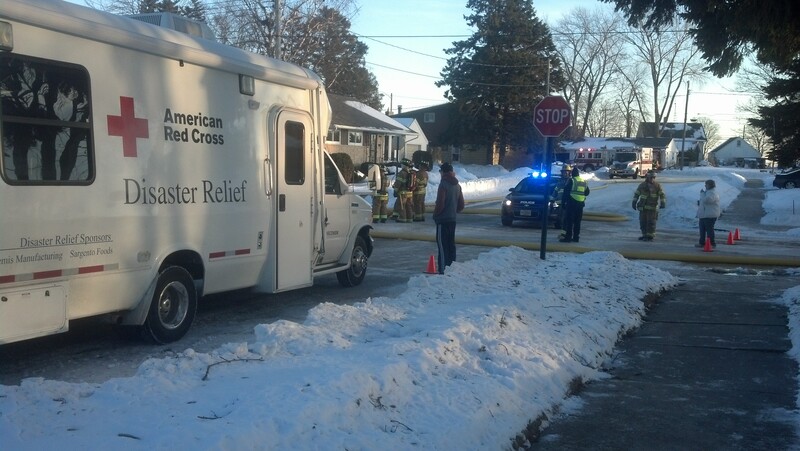 The American Red Cross of Northeast Wisconsin is assisting the displaced residents, Arvey said. Cass Street was closed one block from Roosevelt Street to Irwin Avenue while crews were at the scene. The Brown County Fire Investigation Task Force is assisting. BELLEVUE — A fire that likely started in a garage ravaged a house Sunday at 2217 Kensington Lane. No occupants were home when the fire started, and there were no injuries. The Bellevue Fire Department was called to the home about 4:30 p.m. Sunday. Capt. David Dellemann said the garage was fully engulfed in flames when crews arrived. The cause of the blaze is unknown, and the house, as well as a vehicle inside the garage, appear to be a total loss. The Northeast Wisconsin Region of the American Red Cross said it is assisting the family of three adults and four children. The property is owned by Chi Nguyen and valued at $187,700, according to Brown County land records. The fire is the second in Bellevue in four days. A trailer home on Bellevue Street is a total loss after it was engulfed in flames Thursday afternoon. — hobrien@greenbaypressgazette.com and follow her on Twitter @HannOBrien. Three Red Cross volunteers assisted the family with comfort kits, home-made quilts and after the fire packs. Chief Ed Janke is a member of the American Red Cross Lakeland Chapter board of directors. By Charles Davis/Press-Gazette: Click HERE to view video. HOWARD — A 21-year-old man escaped serious injury this morning in a fire that destroyed a Howard home. Jayson Blake was alone in the lower level of the home at 3149 Knight’s Lane when he woke up surrounded by smoke about 8 a.m. Blake escaped out the front door before crews arrived to flames and heavy smoke coming from the home. He was taken to a local hospital as a precaution but did not appear to be injured, Howard fire Chief Ed Janke said. The fire is believed to have started in the garage and crews took nearly two hours to put it out. Two cars parked in the driveway were not damaged. The ranch-style house is described as a total loss. The home is owned by Kevin and Marla Van Lanen and valued at $144,700, according to Brown County land records. Blake is Marla Van Lanen’s son. Kevin Van Lanen said he lives there with his wife and three sons. The family has fire insurance and will stay with relatives, he said. The Pulaski, Hobart, Green Bay, Suamico and Denmark fire departments assisted.